Way more than just a Photo Software! FotoWorks XL 2019 is the revised edition of a much-used photo software package that provides users with lots of editing controls and effects for their photographic work. If you want to edit a photo using a leading photo software system, then FotoWorks XL 2019 is the package for you. Designed to be functional and easy to operate, the photo software suite is full of options, features, help and guidance. You can edit your photo in a number of ways. To begin with, the photo correction tool will allow you to crop your pictures so that they are better sized for emailing to friends or sharing on social media sites. You can also use it to flip images or to rotate them. As an example, reorienting pictures that have been taken with your camera held sideways is easy. Just click on 'Rotate Picture' and the photo software will immediately offer you the option of rotating your chosen photograph 90 degrees, either clockwise or counter clockwise. So far, so straightforward, right? In addition, FotoWorks XL 2019 will offer you the chance to rotate your picture by 180 degrees or to adjust it manually. This means you can choose to rotate it by any number of degrees you wish, either clockwise or counter clockwise. So, if you have taken a great landscape picture but the horizon is not parallel to the edges of your photograph, for instance, then you can edit it using this simple tool to correct the original error. Bear in mind that this is just one example of the ways in which this powerful photo software can be used in the digital realm to replicate many of the darkroom techniques professional photographers used to employ. For users who want to enhance their images to make them more appealing and vibrant, just use the 'Auto Enhancing' option. You can fine tune any of the digital effects if you want, or let the photo software do its own thing from the preset options. 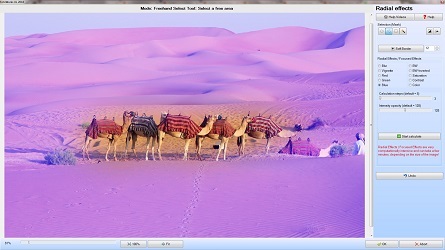 As such, FotoWorks XL 2019 constitutes an extremely versatile photo effect editor. You can use it to process individual images that need a bit of touching up to make them presentable. Alternatively, you can utilize it to process entire batches of photos from your library. Perhaps you might want to add an enhancement to a few dozen photos from a shoot before sending them off to a client? If so, then this photo software package fits the bill, whether you are working on lots of images at the same time or just one. Finally, remember that a photo software free download option is available so you can try FotoWorks XL 2019 out for yourself and get to know just how helpful its photo effects can be in creating more memorable images. Although it has many professional options, FotoWorks XL 2019 is a photo software program that is simple to pick up with a user interface that newcomers will find easy to operate. For any digital editor photos arrive on their computer in a variety of formats depending on the equipment they were taken on. FotoWorks XL 2019 provides its users with the ability to add photo effects with pictures in various file formats. 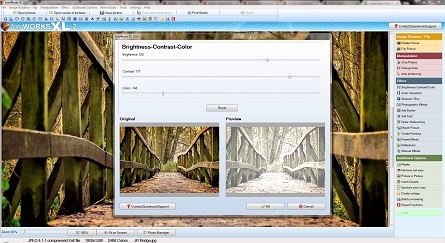 You can even use it to import and edit photo images from the original RAW format, if wanted. Consequently, the editing photo software has been designed for professionals to use. Not only will it suit wedding and event photographers, but it is also helpful for those who want an edit photo effect for products in their catalog or e-commerce store. As such, it is ideal for graphic designers, web page designers and other professionals concerned with image production and who have photos to edit. Nevertheless, FotoWorks XL 2019 is easy photo software to operate. If you are an amateur photographer, then there is no reason you should be put off this simple photo software suite. It is for anyone who has asked themselves, “How do I edit my photo so it will look better?” The program can be used without training and it is easy to pick up within a few minutes. Indeed, you cannot really make mistakes or do any lasting damage to your digital snaps. If you don't like any of the experimental photo effects you might have applied, then all you need to do is to hit the 'Undo' button which is available at every stage of the process to revert back to a former version of your photograph. Remember that every photos effects are different and there is no harm in playing with the program until you get things just right. Soon, even newcomers to digital image manipulation will be using the photo software like a pro and processing their images using the expert functions and features. The design of this photo software is built around the Windows operating system meaning that it is the perfect photo software for PC users everywhere. FotoWorks XL 2019 is photo software Windows 7 users and above can benefit from. The photo software download will work on Windows 8 systems, as well. The layout of the program is ideal for anyone used to Microsoft's style of arranging icons and menus. As such, it is photo software Windows 10 users will feel instantly familiar with. 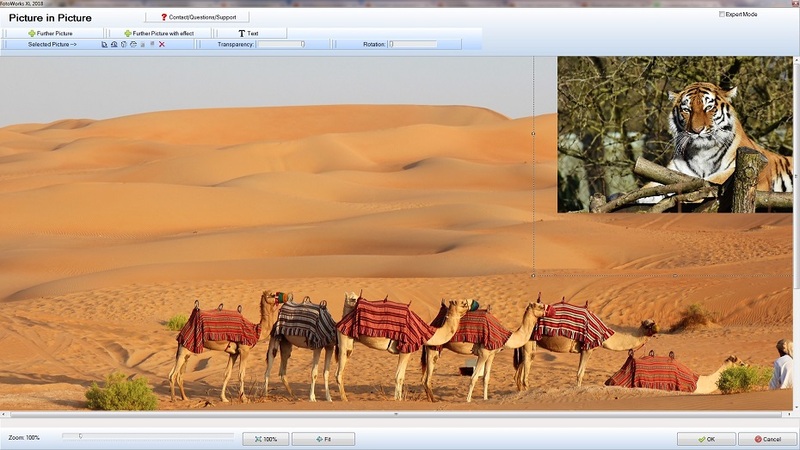 Of course, the helpful user interface of the photo software means that most users will simply start to open their pictures in FotoWorks XL 2019 and start editing straight away. However, there is also a handy 'Help' feature to give you assistance when it might be needed. Just click on this at the top of the screen and select 'Show Help'. From here, you can navigate to the user manual of the PC photo software or watch informative instructional video tutorials on the various functions of the program. If needed, the help option also allows you to contact the software developers to resolve a technical issue. FotoWorks XL 2019 allows users to create memes, posters and greetings cards thanks to the photo software providing a handy text tool. Adding text to a photo can be useful for a number of reasons. Perhaps you want to insert a speech caption or maybe you want to provide a product name in the picture? With FotoWorks XL 2019, any photo funny editor decisions can be added in the form of text, too. Perhaps you have taken a selfie and want to include some amusing text before sharing it online? Whatever your reason for adding text to an image, this photo software package makes doing so a breeze. Simply click on 'Add Text' from the list of options on the right-hand side of the screen or navigate to the same option from the 'Effect' sub menu at the top. A new window will open up that offers users a preview of their chosen photo with the words, “Your Text”, in the middle. All you need to do is to type in the text you want to appear in a box at the top-right of the window. You can write anything you like. Now, click on your chosen wording in the picture and move it around until it is in the right place. FotoWorks XL 2019 allows you to alter the font of the text, just like Microsoft Word, and to adjust the font size. Use the rotation slider control to orientate your text if you don't want it to read on the horizontal vertex of the photo, which is the default setting. Other options for adding text include being able to change the font color. This works just like many Microsoft programs. You can even select a color using the 'Pick Color' tool. Just click on the desired hue within your photo and the text will instantly turn to that color. A number of text effects are available to select from. These include 'Drop Shadow', 'Inset Light' and 'Shadow and Border', to name but three. Two further color selections can be made depending on the sort of effect you have chosen. The program also gives you the opportunity to adjust the shade spacing if a relevant effect has been selected. If you don't want to apply an effect to your text, then all you have to do is to choose 'No Effect' from the pull-down menu. Once everything is set up in the preview as you want it to be, just click on 'OK'. What could be simpler? For an example of how to use the computer photo software to bring images and text together, watch the following tutorial video. To download photo software like FotoWorks XL 2019 is simple and, what's more, the photo software comes with a cost-free trial period. As a leading photo software package, you may be surprised to learn that you can try it without cost. To download edit photo packages as advanced as FotoWorks XL 2019, you would normally expect to have to pay a subscription fee. However, the designers of this suite of editing tools are so confident that you will like what you see that they have made their photo software free download available to all. Anyone with photos to edit can install the program on their computer within a short space of time and get to work immediately. There is no limitation on the usage of FotoWorks XL 2019. For example, none of its advanced features are restricted until you pay. 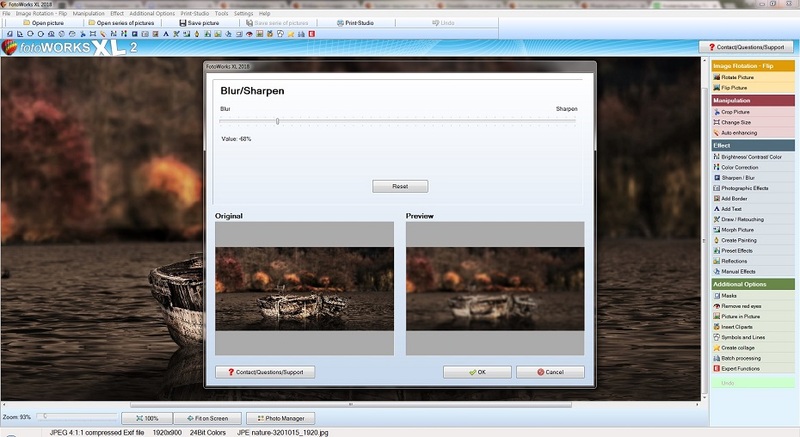 Users are able to try out the entire suite to see whether it suits their style of image manipulation. Given that it has such an extensive series of editing tools, there is little doubt that you will find it a fruitful download to have made. In the unlikely event that you don't get on with it, then there is no obligation to make a purchase once the trial period has run its course. A feature rich photo software system, FotoWorks XL 2019 has plenty of functions and photo effects for you to get to grips with. Not every edit photo download on the market comes with the high-level features that FotoWorks XL 2019 does. Remember that this photo software is fully equipped with all of the advanced functions you need to edit a photo professionally. For example, users can create collages, insert clip art and add symbols and lines into their photographs, as desired. 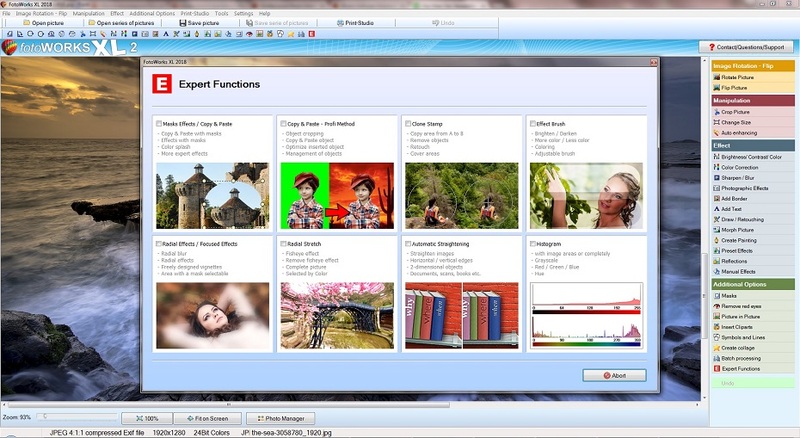 In addition, users who select the 'Expert Functions' option will see an array of advanced features. This includes the ability to add masks to images. This is really useful if you want to copy and paste elements within a picture. Want to make a crowd look a bit bigger? This is the tool for you. For editors who want to cover areas which are not quite right, then the advanced function of clone stamping is available, too. Adjustable effect brushing techniques are also included within the software suite, as is the ability to create radial stretches and focused effects. Of course, how you use these expert tools is entirely down to you – the program opens up an entire world of creative possibilities for you to explore. 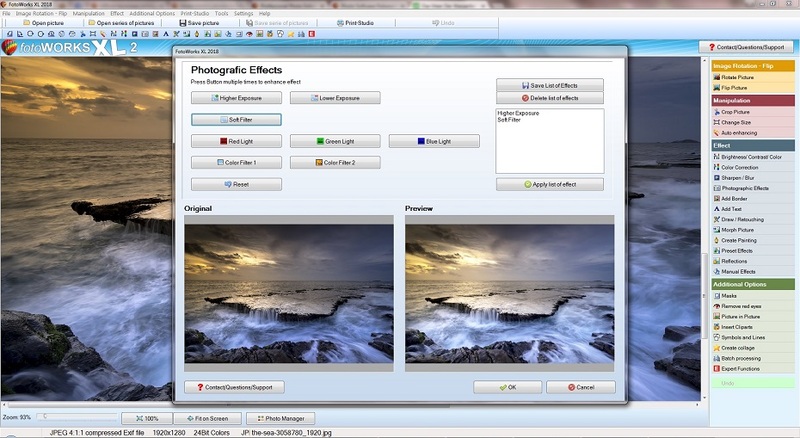 Photo Software - Download here for free!